NewAmericanLawn.com is a website to promote Jonathan Green Lawn Products. It turns out that it really isn't that new, pretty much the standard lawn care program but they do have a lot of information about traditional chemical lawn care. NewAmericanLawn.com also offers some organic products like corn gluten meal and organic fertilizers. It does look like their corn gluten meal is not pelletized so you might want to apply it with a drop spreader rather than a broadcast spreader. If you do use a broadcast spreader, try to do it on a day that isn't windy to keep it from blowing everywhere. When we used to apply corn gluten meal that wasn't pelletized, I'd come home yellow from head to toe...looked like a big bananna. By the way, we do sell Corng Gluten Meal online and can even deliver it right to your home if you're in Cleveland, Akron, or Columbus Ohio. Visit our online store to order or call us at 888-529-6723. Black Beauty Grass Seed looked a little more intruiging because we always get questions about certain brands of seed and people have heard that such and such brand is the best type of seed. Well it turns out that Black Beauty Grass Seed really isn't a particular type of seed or blend of seeds, but it's more of a brand name for their full line of seed blends. My favorite grass seed for Ohio is a seed type called Turf Type Tall Fescue. It's nice because it develops a really deep root system, does not need a lot of water to stay green, and requires less fertilzer than standard mixes. All great things if you're trying to maintain your lawn in an environmentally friendly manner right? It looks like Black Beauty Grass Seed has two mixes that contain Turf Type Tall Fescue - the Drought Tough Grass Seed Mixture, and the Heavy Traffic Grass Seed Mixture. If you were going to buy Black Beauty Grass seed in Ohio, those would be the two mixes I'd recommend. The only thing I'm not really excited about with them is that they also contain Perennial Ryegrass which is not a great grass because its succeptible to all kinds of disease and doesn't tolerate the heat that well. The problem with Perennial Ryegrass is that it sprouts really quickly and can crowd out the Turf Type Tall Fescue. So, if you use a Turf Type Tall Fescue Mix along with Perennial Ryegrass be sure to apply at the recommended rate and NOT heavier. 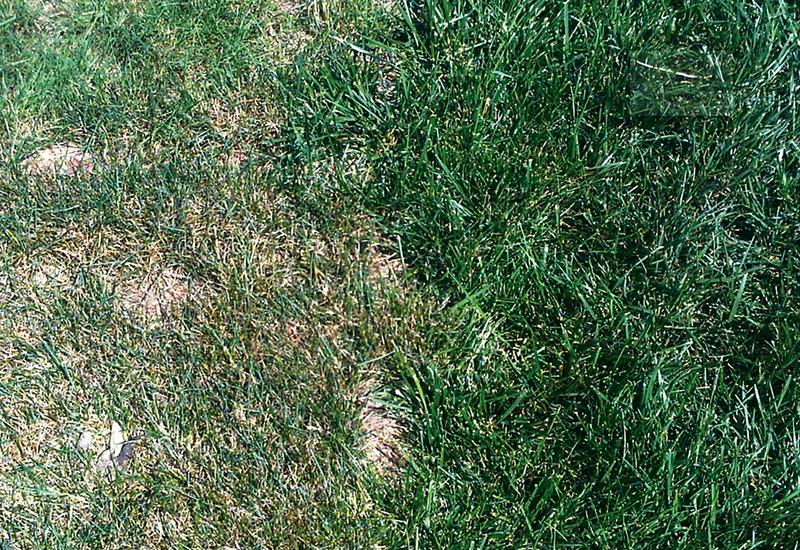 Applying it too heavily can cause you to get all Perennial Ryegrass instead of what you want, Turf Type Tall Fescue. That's why I blend our Tuff Turf with 95% Turf Type Tall Fescue and 5% Kentucky Bluegrass (by weight). The Tall Fescue will establish first and create a nice thick lawn. It's ok to seed it heavily (10 lbs / 1000 s.f.) because you want a Tall Fescue Lawn. The kentucky bluegrass will have difficulty establishing but it eventually will and will help fill in any bare areas that develop. We use a less aggressive bluegrass so that it doesn't take over the lawn. If you really want something "new" for your lawn, try seeding it with a new variety of clover called Microclover. Microclover will help keep your lawn greener and thicker, prevent weeds without chemicals, and reduce your need to fertilize. Learn More about Microclover. Learn more about the best grass seed for your lawn. If you'd like to purchase our special Tuff Turf Grass Seed Mix blended from 95% Turf Type Tall Fescue and 5% Kentucky Bluegrass, visit our online store and check out the Eco Lawn Seed Page.